Unfortunately there is no promotional scheme available on All Australian Casino to assist us in advertising the site. As such we have provided you with an alternative called Dazzle Casino, which is an impressive gaming site offering a great choice for any type of player. Mobile Bingo Bonuses bring you a sleek and impressive site for our Aussie followers out there, called All Australian Casino. This patriotic looking site with iconic imagines, plus funky and colourful pages is definitely eye catching. What really adds to All Australian Casinos appeal is the fact that they state they work on a basis of truth and full transparency with all of the players and offer safe and secure game play. Their games are operated on an RNG (Random Number Generator) meaning that fairness is of the upmost importance to them. Their huge range of games are provided by Net Entertainment Software Company, so you know to expect the highest quality and best range. They have table games, video poker, lottery, live casino and a choice of 80 awesome pokies such as Spinata Grande, Eye of Ra and Dracula; yep you have hours of fun ahead of you! The fact that they offer a number of games on your mobile devices, means that you can take the entertainment with you wherever you go. All you need is a smart phone including Android, iPhone and Tablet devices and those boring chores such as walking the dog, have just got much more exciting. 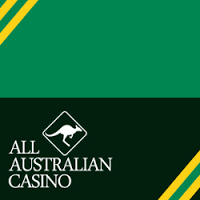 All Australian Casino start with a 100% cash match bonus on your 1st deposit, up to $50 Australian Dollars. This means that you’ll basically be doubling your money and will not only increase your playing time but also your chances of winning. So if you take advantage of this offer and add the maximum amount then you’ll walk away with $100 Australian Dollars in total. Although most other popular casinos tend to offer additional bonuses such as cash back bonuses, All Australian Casino prefer to keep funds for their incredible promotions. They pride themselves on being innovative and unique in their promotions, so make sure you check them out regularly as you never know what you’ll get. If you’re a Facebook fan then make sure you check out All Australian Casinos page, so you can keep up on the latest games and promotions. They offer live support 24/7 where you can speak to the customer care team who will deal with any questions or issues. Accepted banking methods include Credit and Debit cards, Skrill, Neteller and U Kash. So grab some tinnies from the fridge, register on your mobile and let us take you through to All Australian Casino.